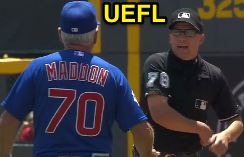 1B Umpire Adam Hamari ejected Cubs Manager Joe Maddon for arguing a balk call in the bottom of the 4th inning of the Cubs-Reds game. With one out and one on, Cubs pitcher Kyle Kendricks attempted to pick off Reds baserunner R1 Tucker Barnhart. Replays indicate Kendricks threw from the rubber to directly to first baseman Anthony Rizzo, who was positioned several steps in front of first base and did not appear to attempt to retire Barnhart, the call was correct. * At the time of the ejection, the Reds were leading, 4-1. The Reds ultimately won the contest, 9-1. This is Adam Hamari (78)'s second ejection of 2015. Adam Hamari now has 10 points in the UEFL Standings (5 Previous + 3 AAA + 2 Correct = 10). Crew Chief Fieldin Culbreth now has 8 points in Crew Division (7 Previous + 1 Correct Call = 8). *The official interpretation reads: "The pitcher shall be charged with a balk if, while in contact with the rubber, he throws to the first baseman who is either in front of or behind first base and obviously not making an attempt at retiring the runner at first base. However, there is no violation if the pitcher throws the ball directly to first base in this situation. Also note that there is no violation if the pitcher attempts a pickoff at second and throws to an infielder who is in front of or behind that base (i.e., this violation is only in reference to pick-offs at first [and third] base)." This is the 131st ejection of the 2015 MLB Regular Season. This is the 59th Manager ejection of 2015. This is the Cubs' 5th ejection of 2015, T-1st in the NL Central (CHC, CIN, STL 5; PIT 4; MIL 3). This is Joe Maddon's 3rd ejection of 2015, 1st since May 6 (DJ Reyburn; QOC = Y [Balls/Strikes]). This is Adam Hamari's first ejection since June 9, 2015 (Jay Bruce; QOC = N [Balls/Strikes]).